For this week’s Wednesday Walking Tour I promised a hidden gem, but the quality of gems is usually measured by the eye of the beholder. This hot dog stand holds a special place in my heart. Chicago is as notorious for their gangsters and fedoras as their hot dogs. Vienna pure beef hot dogs are our claim to fame and no one builds them better than Gene and Jude’s. 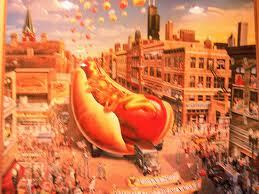 They are the largest purveyor of the “original” Chicago style dog. You can order a single or double dog on a poppy-less bun, dressed with mustard, onion and piccalilli relish. For those more adventurous you can add sweet or spicy peppers. The fresh cut fries are Idaho potatoes thrust through a machine that coverts the spuds into perfect sized French fries and they’re tossed into bubbling vats of oil and loaded right on the dog and wrapped in wax paper. Tamales round out the menu. But whatever you do, do not ask for ketchup. As with most Chicago hot dog stands Gene and Jude’s doesn’t contain a single packet of ketchup and they will probably ask you to vacate the premises. And trust me they might, the counter help is known for their hurried and surly dispositions. Gene and Jude’s is located just outside the City limits in the suburb of River Grove, which sits beyond O’hare airport and near a huge Forest Preserve. Gene and Jude’s was founded in 1946 by friends and Chicago city workers Gene Mormino and Jude DeSantis and it hasn’t changed much since the fifties. This hot dog stand is a small place with harsh fluorescent lights and a line out the door and onto the large blacktop parking lot. The sparse interior has no tables and chairs, only a chest high counter that circles the parameter. Gene and Jude’s has won Best Hot Dog in America and it has consistently been in the top ten for Chicago’s best quick eats. The greatest hot dog stand in the world is a throwback to a time when a little joint could keep their buns steamed just right, and their red hots, hot and crisp. A single bite of a Gene and Jude’s hot dog snaps you back to summer nights during high school when you and a friend sat on the hood of her old car and ate under the stars. So the quality of this hidden gem might just be in the memories.